If there was a way to monitor Prime Minister Benjamin Netanyahu’s mental state during his press conference with US President Donald Trump, we would see a declining gradient on a graph, from high tension to a great relief. The fact that Netanyahu got exactly what he wanted from the American president is indisputable. One state, two states (Coffee? Tea? It doesn’t matter, whatever is easiest for you)—that is the exact attitude Netanyahu would like to hear from an American president. Someone who hasn’t got a clue what it’s all about, who is likely unfamiliar with the map of Israel before 1967 and doesn’t know where the disputed lands are, and whose understanding of the issues on the agenda is about as deep as the length of his short temper. I apologize to all of those who were so excited by Trump last Wednesday. To me, he still seems as ignorant and shallow as he was throughout his entire campaign. An egocentric, slipshod and inarticulate person, who has no idea what his opinions are on each of the issues on the agenda, and worse—what his opinions will be tomorrow. He is someone who is engaged in how his views make him look, rather than in the really important stuff. Only a person like that can decide to hold his first press conference with the Israeli prime minister before sitting down to talk to him, because everything has all been agreed before anything has been discussed, and anyway, he could always change, deny, talk about false truth or about alternative facts and blame, always blame, the media. In other words, Hezbollah Secretary-General Hassan Nasrallah is probably right: The world’s nations, including Israel and the Palestinians, will only benefit from having an idiot in the White House, as Nasrallah referred to him. But beneath the mutual flattery, the Trump décor and the common goal the two leaders saw before their eyes—to prove former President Barack Obama’s insignificance—the two sides conveyed pretty clear messages. Netanyahu, who tried to avoid in any way saying what Bayit Yehudi leader Naftali Bennett wanted to hear—in other words, abandoning the Bar-Ilan speech and the two-states-for-two-people idea—spoke about recognizing a Jewish state and Israeli security control of the entire area. On Trump’s part, we can talk about three main messages, for now at least, and without committing to what the messages will be tomorrow: He wants a deal, it doesn’t matter what deal, that both sides will agree on. The Saudi initiative, the regional peace which has been discussed for years, and which Israel had a unique opportunity to try to reach after Operation Protective Edge, is now on the agenda. And he, Trump, expects a “holdback” in settlements. Trump said that halfheartedly, only when he was asked about it directly by the hostile media. So if you heard joyous sounds, like you sometimes hear during a soccer game when an unusual goal is struck, those were the sounds of the Right. And they have a good reason to make those sounds: Not only have they managed to trap Netanyahu in their demands, now Trump has done it as well in his declarations. I don’t want to spoil the party for Bennett and his partners, but they should pay attention to the fact that even before the Trump-Netanyahu meeting, CIA Director Mike Pompeo met with Palestinian President Mahmoud Abbas. That meeting in Ramallah could indicate what the American security establishment thinks about the need for bilateral negotiations. Upon his return to Israel, Netanyahu had to deal with his greatest fear—the need to decide. Up until now, he was able to say that he cannot withdraw from the Bar-Ilan speech, from the two-state vision, from the settlement construction freeze, because America is against it. Now, all the barriers have been removed. The prime minister will have to decide whether he is sticking to the vision he presented eight years ago in his Bar-Ilan speech, or adopting Bennett’s plan for the annexation of Judea and Samaria, which means, as President Reuven Rivlin said last week, granting citizenship to all Arab residents of Judea and Samaria. Netanyahu is a much more intelligent, experienced and sensible than Trump. He knows how the world will respond if he decides to implement what the American president is allowing him to implement. After all, he was the one who needed the barriers placed by the previous administration, even more than Obama wanted to place those barriers. It was his excuse for the freeze, for the inaction. What will he say now to all those who want to build, annex, keep controlling the Palestinians? Trump singlehandedly pulled the rug of excuses from under Netanyahu’s feet. 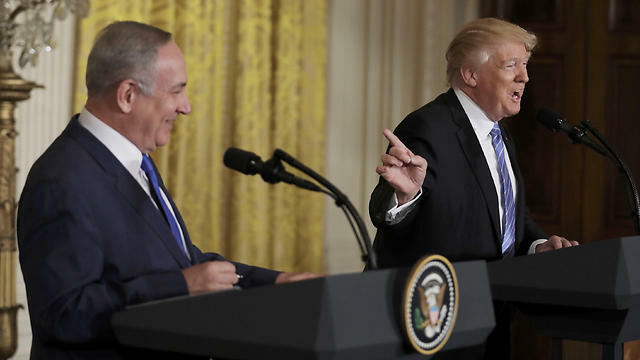 Israel has no greater friend than Trump, Netanyahu said at the press conference in an exaggeration which matches this era so much. That remains to be seen. Before his trip to the US, Netanyahu was petrified. He realized that, in a certain sense, his situation is worse than it was in the Obama era, because then he knew exactly what to expect. There was a reason why he tried to lower expectations among his ministers, those who demanded that he seize the historical opportunity. It’s no coincidence that his comments at the cabinet meeting, that Trump must not be confronted because of his character and complexity, were leaked. I suggest that we remember that even during these euphoric days. Even if the visit was successful, it’s all in the short run. Trump is a total mystery, an unpredictable person, and there is no way of knowing what his stance will be tomorrow. The weeks that have passed since he entered the White House have only confirmed all the fears, that the man arrived completely unprepared. It’s unclear what Netanyahu feared the most—that Trump would return to the traditional stances of the American administration, two states and the 1967 borders with land swaps, or that he would say what he actually said at the White House press conference, that he was giving him a free hand. He already did Netanyahu a disservice when he promised to move the US embassy from Tel Aviv to Jerusalem. Who even wants that? Who needs the commotion that such a move would create—European Union sanctions, all hell breaking loose in the Arab world, an intifada? Netanyahu is now in a situation of “damned if I do and damned if I don’t.” Any choice he makes could be problematic. The American reception was a dream that even he didn’t dream of. Sara turning into a princess, a pumpkin turning into a carriage, magical hours of slow dancing in a golden palace. There is no champagne in the world which could provide that same feeling of intoxication, the euphoria the Netanyahus experienced at the Trumps’ new home. In the report Trump received about the investigations against Netanyahu, there was likely a special chapter about Mrs. Netanyahu. Trump studied it well. This chauvinist, who is infamous for his treatment of, and behavior towards, women doesn’t even treat his own wife with the nobility he showed our Sara. But real life is not at the Blair House in Washington, crowding alongside the aggressive Trump and the beautiful Melania. Real life is here. And here, he has the right-wing camp to contend with, and it will demand that he seizes the opportunity he was given in full. And he also has the investigations, and the Likud ministers preparing for a change of government. Netanyahu will discover that it’s all in his hands. Trump won’t lift a finger. He won’t push for a solution and won’t force Israel to reach an agreement. He has enough urgent matters on the agenda. What Netanyahu will have to do is the exact thing he doesn’t know how to do: Decide.